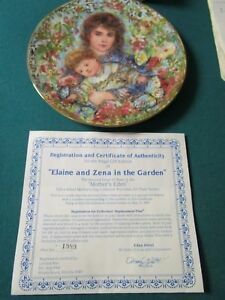 Edna Hibel Mother's Day 1988 Plate "Sarah and Tess", by Knowles, 8 1/2"
the_antiquers_chest has no other items for sale. Sales tax may apply when shipping to: IA*, MN*, NY*(8.7%), WA*. Thank you very much for your purchase! Your item is going to be deposited at the USPS office next day. It is securely packed. I made my best effort to describe the item condition and other information, but if you still have any question related to the item, IF IT ARRIVES DAMAGED or if I can be of further assistance, please, do not hesitate in contacting me.